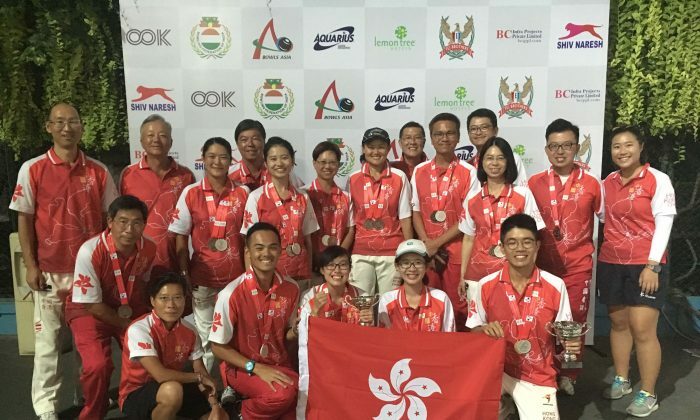 Hong Kong young bowlers did the territory proud at the 12th Asian Lawn Bowls Championship and Asian Under 25 Lawn Bowls Championship in India, bringing home two golds, two silvers and a bronze medal. The performance of senior squad was relatively low key but all members still managed to win a medal. In fact, the team won medals from all disciplines except for the men’s pairs. Of the four young representatives namely Gloria Ha, Angel So, James Po and Adrian Yau, Ha caught the eye of most people as she struck the first gold for Hong Kong. Ha, who started bowling in 2010, has represented Hong Kong in several international competitions and secured gold medals at the National Bocce Elite Lawn Bowls Championship in China in 2015 and the Dutch Open in 2016. She also became the youngest bowlers to participate in the World Championship when she represented Hong Kong last year. She started her journey in the U25 Girls Singles well, won four of the five games in the group stage to finish top of the table. She faced compatriot Angel So in the semi-finals and emerged victorious after a hard fought game. This also condemned So to a bronze medal. She faced the winner of group B, Nural Alyani Bt Jamil from Malaysia in the final. The game was tight and the score was tied on the sixth end (5:5) and the ninth end (8:8). Then Ha got into the game and opened up a lead of 19:9 in the next eight ends. When she just needed two shots to kill off the match, Ha suddenly lost her touch and allowed her opponent to score a total of nine shots in the following four ends to pull the scoreline to 19:18. “At that point I told myself to focus on getting the bowls close to the jack, not to think about winning or losing,” recalled Ha. And she did exactly that. Her second and third bowls were very close to the jack and her opponent could not turn it. 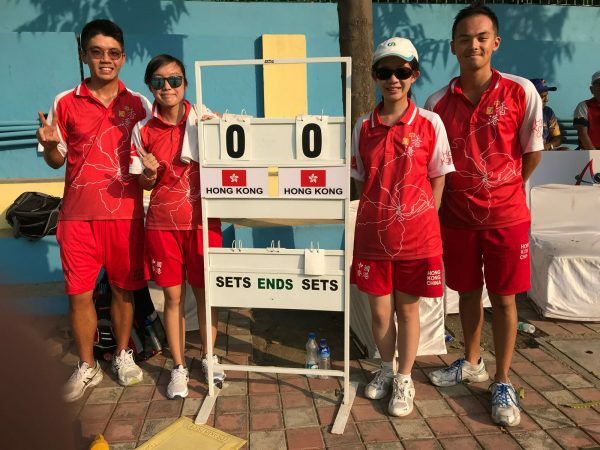 Ha continued her good performance with partner James Po in the U25 mixed pairs to beat teammate Angel So and Adrian Yau to clinch her second gold. Ha was very happy about her performance throughout the competition, “I think I performed quite well in these few days, especially on my ability to quickly adapt to condition of the greens. My consistency also helped my performance. “The achievement also showed that my choice of devoting more time on bowling was not a wrong thing and I am very glad to have such good results,” said Ha. For the boys, the gold in the mixed pairs was a consolation for James Po after losing to Alok Lakara of India in the boys singles. For the senior squad, the closest they got to gold was in the women’s fours and the man’s singles. The women’s fours of Jenny Miu, Yunse Ha, Elisa Cheung and Phyllis Wong finished top of their group, progressed to the semi-final and triumphed against Singapore to face a strong Malaysian team in the final. The Hong Kong team were chasing the game for most of the time and the closest they got was in the eighth end when the gap was cut to a single shot. Then they lost 10 shots in the following five ends to hand the gold to their opponent. It was a similar situation in the men’s singles final when Tony Cheung faced Malaysian Mohammad Soufi Rusli. He was behind throughout and at one point the gap was a massive 13 shots. Cheung did not give up and crawled back slowly to narrow the gap. However it was too little too late and Soufi finally prevailed with a 21:11 victory. Once again Malaysia showed their dominance in the Asia bowls arena after being crowned the overall winner of the competition. They collected a total of five golds, followed by the three golds won by India, including the U25 boys singles. Singapore also scored gold in the men’s fours. The event was held at the DPS Sports Complex at RK Puram, New Delhi, India from Oct 4 to 9. A total of 11 bowling countries in the region participated in the event, including host India, Brunei, China, Hong Kong, Japan, Malaysia, Pakistan, Philippines, Singapore, Sri Lanka and Thailand. Regular participant Macau did not join this time. In all disciplines, players were divided into two groups to play round robin matches, with the top two qualifying directly for the semi-finals. The next Asian Bowls Championship will be hosted by China in 2018. The Premier Division continues this Saturday Oct 14, and on Sunday, Oct 15 the Women’s semi-finals of the National singles will be played – venue to be decided.